Malaekeh-Nikouei, B., Sajadi Tabassi, S., Jaafari, M., Davies, N. (2005). Preparation and Characterization of PLGA Microspheres Loaded by Cyclosporine-Cyclodextrin Complex. Iranian Journal of Pharmaceutical Sciences, 1(4), 195-201. Bizhan Malaekeh-Nikouei; Sayyed A. Sajadi Tabassi; Mahmoud R. Jaafari; Nigel M. Davies. "Preparation and Characterization of PLGA Microspheres Loaded by Cyclosporine-Cyclodextrin Complex". 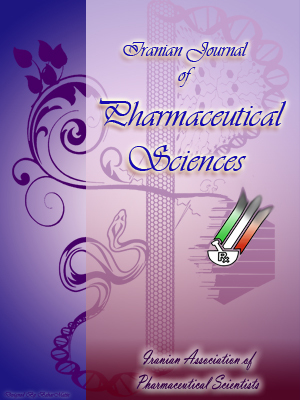 Iranian Journal of Pharmaceutical Sciences, 1, 4, 2005, 195-201. Malaekeh-Nikouei, B., Sajadi Tabassi, S., Jaafari, M., Davies, N. (2005). 'Preparation and Characterization of PLGA Microspheres Loaded by Cyclosporine-Cyclodextrin Complex', Iranian Journal of Pharmaceutical Sciences, 1(4), pp. 195-201. Malaekeh-Nikouei, B., Sajadi Tabassi, S., Jaafari, M., Davies, N. Preparation and Characterization of PLGA Microspheres Loaded by Cyclosporine-Cyclodextrin Complex. Iranian Journal of Pharmaceutical Sciences, 2005; 1(4): 195-201. The purpose of this study was to prepare and characterize microspheres loaded by cyclosporine A(CyA)-cyclodextrin (CD) complex. To achieve this goal, PLGA microspheres loaded by CyA CD complex were prepared by multiple emulsificationsolvent evaporation methods.Morphology, size, encapsulation efficiency and drug release from these microspheres were evaluated. Microscopic evaluation of microspheres showed that microspheres were spherical in shape. The size analysis results indicated that size range varied from 1 to 50 mm for complex loaded microspheres. Encapsulation efficiency of microspheres was increased by increasing drug to polymer ratio. Drug release was found to be biphasic with a first more rapid release phase (burst) followed by a slower phase. After two weeks, 43.40%±3.45 of CyA was released from these microspheres. In conclusion, microspheres loaded with CyA-CD complex were prepared that could be used for control delivery of CyA. Cyclosporine A (CyA) is an immunosuppressive oligopeptide which is used to prevent organ rejection after transplantation 3and for the treatment of selected autoimmune diseases such as rheumatoid arthritis, Behcet’s disease, psoriasis and nephrotic syndrome [1, 2]. This poorly water soluble drug is a highly specific and potent inhibitor of T- lymphocytes by binding to cyclophilin in cytoplasm [1, 3,4]. Administration of this drug with 11 amino acids is limited by its hepatotoxicity, nephrotoxicity and neurotoxicity . Due to relatively high molecular weight, very high lipophilicity and poor solubility in aqueous media, oral absorption of CyA is usually low [6, 7]. These properties have limited the design of cyclosporine dosage forms for various administration routes . To overcome the problems associated with conventional delivery systems and to improve the efficiency of CyA, alternative dosage forms such as microemulsions , microspheres [5, 9-12], nanospheres [3, 9] and liposomes [13-15] have been suggested. Figure 1. Effect of different concentrations of α-cyclodextrin, HP β-cyclodextrin and mixture of cyclodextrins on aqueous solubility of CyA (Mean±SD, n=3). The use of biodegradable microspheres as drug delivery systems offer several important advantages including controlled and continuous drug release, convenient administration, biodegradability, biocompatibility, protection of drug against acid and enzymes in the GI tract and no need for daily use of the drug [16-18]. These microspheres are suitable alternatives for conventional dosage forms. Concerning the use of different biodegradable polymers, PLGA has been widely used for preparation of microspheres due to its safety and physicochemical properties, as it is nontoxic, biodegradable and biocompatible [19-22]. Cyclodextrins (CD) are a group of cyclic oligosaccharides obtained from the enzymatic degradation of starch. They have torus shape with hydrophilic outer surface and a lipophilic central cavity. These properties cause CDs to form inclusion complexes with lipophilic molecules [23-26]. The three major CDs, α, β, and γ, are composed of six, seven or eight D-(+) glucopyranose units, respectively. The aqueous solubility of a drug-CD complex in particular, can be dramatically different from that of the free drug. This complexation will affect many of the physicochemical properties of drug without alteration of the intrinsic pharmacokinetic [27, 28]. Normally, they are used to enhance solubility, bioavailability and stability. Also, they protect drugs against physicochemical and enzymatic degradation [29, 30]. No covalent bonds exist between the CD and its guest, so complexation can be considered a dynamic process. Therefore, a drug included within the cyclodextrin cavity may be dissociated upon dilution, displaced by a more suitable guest or transferred to a matrix for which it has a higher affinity, such as a biological membrane . CDs have been successfully used to modify the release features of polymeric systems mainly due to their capability of forming inclusion complexes with drugs that effect drug solubility and/or diffusivity [16, 21, 29]. The aim of this study was to incorporate CyA-CD complex within microspheres to study the effect of CDs incorporation on the properties of these microspheres. Different microsphere formulations loaded by complex were obtained and fully characterized for morphology, size, encapsulation efficiency and release rate of CyA. Figure 2. SEM of microspheres loaded by CyA-cyclodextrin complex. Magnification of image is x5000. PLGA 50:50 (MW 40000-75000) were obtained from Sigma (USA). Cyclosporine A was purchased from LC laboratories (USA). Dichloromethane and polyvinyl alcohol (PVA) (MW27000) were supplied by Merck (Germany). α-CD and HP β-CD were obtained from American Maize-Products Company (USA) and Roquette (France). All materials were of analytical grade unless otherwise stated. For phase-solubility studies of CyA, aqueous solutions of α-CD, HP β- and, mixture of α-CD and HP β-CD with different concentrations were prepared. An excess amount of CyA powder was added to vials containing various concentrations of CDs.The vials placed on rotator (Rotek, Australia) at room temperature (22-23 ºC) for 7 days.F i n a l l y, aqueous solutions were filtered through a 0.45 μm membrane filter (PTFE Filter, 17 mm, PM Separations) and the filtrate was analysed using high performance liquid chromatography (HPLC). In all cases, solubility determinations were repeated three times and intrinsic solubility of CyAin water was measured [23, 25]. Figure 3. Cumulative percent release of CyA from microspheres loaded by CyA-CD complex for 1:10 drug to polymer ratio. (Mean ± SD, n=3). The shape and surface characteristics of microspheres were examined by optical microscope (Olympus, Germany) and scanning electron microscopy (SEM)(LEO, 1450 VP, England), respectively. Samples were prepared on stubs and coated by platinum.Mean diameters and particle size distribution of microspheres were measured by particle size analyzer (Mastersizer, Malvern, UK). Zeta potential in basis of Laser Doppler spectroscopy was determined by using Zetasizer (3000HSA, Malvern, UK) after suitable dilution with double distilled water. Results were reported as Means±SD. A known amount of CyA loaded microspheres was dissolved in 1 ml dichloromethane and after filtration through 0.45 μm filter, 20 μl of this solution was injected to HPLC. Quantitative determinations were performed by HPLC system (Shimadzu,Japan) using a C18 column (Alltech, USA),UV-Vis detector (SPD-10A) at 214 nm, auto sampler (SIL-10AD). A mobile phase composed of 90% methanol and 10% water at a flow rate of 1.5 ml/min was used. The injection volume was 20 μl. PLGA microspheres (20 mg) loaded with CyA-CD were suspended in phosphate buffer (pH 7.4, 500 ml) containing 0.01% (w/v) of polysorbate 80. The suspension was gently shaken in a water bath at 37 ºC. At various time intervals, samples were centrifuged (13000 rpm for 5 min.) and 400 μml of the supernatant were taken and replaced with fresh medium. CyA released into the supernatant was quantified by HPLC as described above and cumulative release pattern was established and the results were reported as Means±SD . The solubility of CyA in water increased linearly by increasing the HP β- C D concentration, but the relation between α- cyclodextrin concentration and aqueous solubility of CyA was non-linear (Figure 1).α-CD was more effective than HP β-CD, but the difference between solubilizing effects of 15% and 20% α-CD was not significant.This effect is a result of more suitable size of the cavity of α-CD (4.7-5.3 Å) than that of HP β-CD (6.0-6.5 Å) [23, 33]; because forinclusion complex to be formed, some lipophilic moiety of the drug molecule has to fill the hydrophobic cavity . In this case, different aliphatic chains in CyA structure may interact better with hydrophobic central cavity to form inclusion complex. Table 1. Mean size, zeta potential, encapsulation efficiency and product yield of microspheres loaded by CyA-cyclodextrin complex (Mean±SD, n=3). The phase solubility profile of CD mixtures was the same as α-CD (Figure 1). Mixture of 15% α-CD and 20% HP β-CD solutions had the best effect and was chosen for microsphere loading. In this case, aqueous solubility of CyA increased to 4.2039±0.1267 mg/ml. Evaluation of microspheres by optical microscopy showed that microspheres were spherical in shape. No drug crystals were observed on any of the samples. SEM studies displayed that microspheres has smooth surfaces (Figure 2), but in our pervious study, SEM evaluation of microsphere encapsulated with CyA showed that some islands of drug have formed on the surface of microspheres . In this case, by increasing the polymer ratio, microspheres’ shape changed and aggregation increased. Results of particle size analysis revealed that the size range varied from 1 to 50 μm for these microspheres. The mean sizes for microspheres loaded by CyA-CD complex, containing 1:5, 1:10 and 1:20 drug:plymer ratios, were 7.58±2.58, 10.69±2.80 and 12.85±3.64 μm, respectively. Particle size and encapsulation efficiency data of different microsphere formulations are summarized in Table 1. For these microspheres, encapsulation efficiency increased with increasing drug to polymer ratio. Encapsulation efficiency for 1:5, 1:10 and 1:20 microspheres loaded by CyA-CD complex was 26.46%±2.57%, 36.69%±3.21% and 57.48%±2.60%, respectively. Product yield was reasonable and varied from 89 to 97% for different formulations. The release of CyA was biphasic with a rapid release phase (burst) followed by a slower phase (Figure 3). After two weeks,43.40%±3.45 of CyA was released from microspheres loaded by complex. In the present study, addition of the CDs increased the drug release at least by two fold when compared with result of our last study .In different studies, both increasing and retarding effect of CDs on drug release have been observed. For example, it has been shown that incorporation of CD into microsphere may improve the hydration of the microsphere . Indeed, incorporation of CDs into polymeric drug delivery systems can influence the mechanisms by which drug is released. Complexed CDs for example, can modify drug solubility or diffusivity, improve hydration of the polymer matrix or promote its erosion . Presence of CDs in the microspheres may promote their dissolution rate . Also, the addition of CD to polymeric systems may enhance drug release by acting as channeling or wicking agents or by promoting erosion of the matrix . Drug release rate from the biodegradable PLGA microspheres is mainly controlled by polymer erosion, structure of the porous microenvironment and drug diffusion . Depending on microsphere preparation technique, drug molecules are either dispersed within the polymer or deposited inside spherical, or nearly spherical, occlusions (macropores) formed within the particle during processing. Upon immersing microspheres in an aqueous medium, water penetrates toward the centre of the particle (hydration phase) and activates drug diffusion through the innate micropores of PLGA (angstrom- or nanometer-dimension) and the macroporous structure of the particle. In the case of macromolecules, the diffusion in the porous network is highly limited due to the cramped space available and so extremely slow until pores grow in size and/or coalesce because of polymer erosion . Different factors such as polymer type, preparation method and drug characteristics influence drug release from these matrices . In conclusion, according to the results of this study, microspheres with biphasic release pattern were prepared. These microspheres are not suitable for rapid effects and can be used as slow-release dosage forms. Also, CD complexation affected microsphere properties especially drug release kinetics which could be a result of drug solubility improvement. Ugazio E, Cavalli R, Gasco MR. Incorporation of cyclosporine A in solid lipid nanoparticles. Int J Pharm 2002; 241: 341-4. Urata T, Nakano M, Arimori K. Modification of release rates of cyclosporine A from poly (Llactic acid) microspheres by fatty acid esters and in vivo evaluation of the microspheres. J Control Release 1999; 58:133-41. Lee E, Choi H, Lee S, Kim C. Bioavailability of cyclosporine Adispersed in sodium lauryl sulfate dextrin based solid microspheres. Int J Pharm 2001; 218: 125-31. Miyake K, Aroma H, Ire T, Hirayama F, Onekama K. Enhanced absorption of cyclosporine A by complexation with dimethyl-beta-cyclodextrin in bile duct-cannulated and non cannulated rats. Biol Pharm Bull 1999; 22: 66-72.
administration of lecithin and sandimmune neoral. Int J Pharm 2001; 216: 17-21. [ 8] Mueller EA, Kovaric JM. Improved dose linearity of cyclosporine formulation. Pharm Res1994; 11: 301-4. Ford J, Woolf J, Florence AT. Nanospheres of cyclosporine A: Poor oral absorption in dogs. Int J Pharm 1999; 183: 3-6.
immunosuppression and nephrotoxicity in rats. Eur J Pharm Sci 2001; 12 :471-8. Passerini N, Craig DQM. Characterization of cyclosporine A loaded poly (D, L lactide- coglycolide) microspheres using modulated temperature differential scanning calorimetry. J Pharm Pharmacol 2002; 54: 913-9. Sanchez A, Vila-Jato JL, Alonso MJ. Development of biodegradable microspheres and nanospheres for controlled release of cyclosporine A. Int J Pharm 1993; 99: 263-73. Vadiei K, Lopez-Berestein G, Perez-Soler R, Luke DR. In vitro evaluation of liposomal cyclosporine. Int J Pharm 1989; 57: 133-8. Rev Ther Drug Carrier Syst 2001; 18:141-72.
insulin/hydroxypropyl-β-cyclodextrin system. J Control Release 2005; 102: 71-83.
microparticles on drug release: Experiment and theory. J Control Release 2004; 96: 123-34. Jaifwal J, Gupta SK, Kreuter J. Preparation of biodegradable cyclosporine nanoparticles by high pressure emulsification solvent evaporation process. J Control Release 2004; 96: 169-78. Rodrigues JM, Melo K, Matos CE, Aguiar MMG, Silva A. The effect of cyclodextrins on the in vitro and in vivo properties of insulin loaded poly (D, L-lactic-co-glycolic acid) microsphere. Artificial Organs 2003; 27: 492-7. Hoyn S.H. Biodegradable poly (lactic acid) microspheres for drug delivery systems. Yonsei Med J 2000; 41: 720-34. Jain RA. The manufacturing techniques of various drug loaded biodegradable poly(lactide-coglycolide) (PLGA) devices. Biomaterials 2000; 21: 2475-90. Okada H, Toguchi H. Biodegradable microspheres in drug delivery. Crit Rev Ther Drug Carrier Sys 1995; 12: 1-99. Ran Y, Zhao L, Xu Q, Yalkowsky SH. Solubilization of cyclosporine A. AAPS Pharm Sci Tech 2001; 2: (www.aapspharmscitech.org). Lallemand F, Felt-Baeyens O, Besseghir K, Behar- Cohen F, Gurny R. Cyclosporine Adelivery to the eye: a pharmaceutical challenge. Eur J Pharm Biopharm 2003; 56: 307-18. Loftsson T, Magnudottir A, Masson M, Sigurjonsdottir JF. Self-association and cyclodextrin solubilization of drugs. J Pharm Sci 2002; 91: 2307-16. Loftsson T, Matthiasson K, Masson M. The effect of organic salts on cyclodextrin solubilization of drugs. Int J Pharm 2003; 262: 101-7. Stella VJ, Rao VM, Zannou EA, Zia V. Mechanism of drug release from cyclodextrin complexes. Adv Drug Deliver Rev 1999; 36: 3-16. Loftsson T, Frioriksdottir H. The effect of watersoluble polymer on the aqueous solubility and complexing abilities of β-cyclodextrin. Int J Pharm 1998; 163: 115-21. Filipovic-Grcic J, Voinovich D, Moneghini M, Becirevic-Lacan M, Magarotto L, Jalsenjak I. Chitosan microspheres with hydrocortisone and hydrocortisone hydroxypropyl-β- c y c l o d e x t r i n inclusion complex. Eur J Pharm Sci 2000; 9: 373-9. Davis ME, Brewster ME. Cyclodextrin-based pharmaceutics: Past, present and future. Nature Rev 2004; 3: 1023-35. Filipovic-Grcic J, Becirevic-Lacan M, Skalko N, Jalsenjak I. Chitosan microspheres of nifedipine and nifedipine-cyclodextrin inclusion complexes. Int J Pharm 1996; 135:183-90. Diwan M, Tafaghodi M, Sammuel J. Enhancement of immune responses by co-delivery of a CpG oligodeoxynucleotide and tetanus toxoid in biodegradable nanospheres. J Control Release 2002; 85: 247-62. Martin Del Valle EM. Cyclodextrins and their uses: a review. Process Biochem 2004; 39: 1033-46. Malaekeh-Nikouie B, Sajadi Tabassi SA, Jaafari MR. Preparation and characterization of biodegradable microspheres encapsulated with cyclosporine A using different grades of PLGA. Iran J Basic Med Sci 2004; 7: 240-9.